This luxurious lamb dish makes for a perfect Sunday lunch. Bursting with delicious flavour, this meal is sure to be enjoyed by everyone. Preheat the oven to 220oC/gas mark 7. 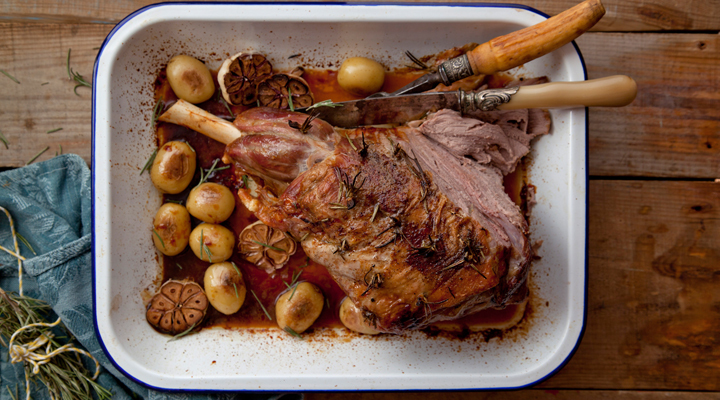 Place the leg of lamb in a large roasting tin. Cut some deep incisions into the lamb and insert slices of garlic and small rosemary sprigs into the incisions. Season well with salt and pepper. Place the lamb on the top rack of the oven and cook for 11/2 to 13/4 hours, then remove from the oven and allow the lamb to rest. Meanwhile, cut all the vegetables into small chunks. Heat a large pan over a high heat, drizzle with oil and fry off the vegetables until they are all browned and beginning to soften. Pour in the tomato and basil sauce and allow the vegetables to simmer for 15 to 20 minutes over a medium to low heat. Carve the lamb into slices and serve with ratatouille on the side.